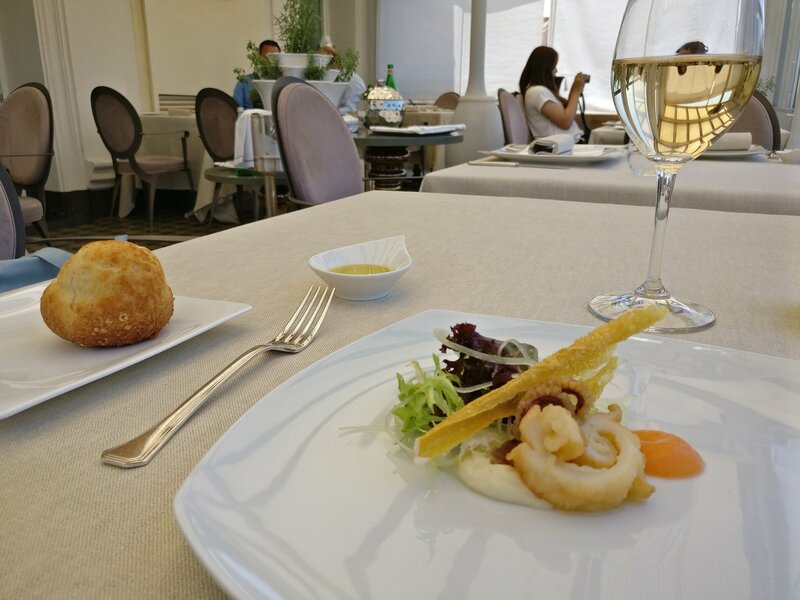 I had a surreal lunch at Aroma Restaurant in Palazzo Manfredi, Rome. Surreal because this restaurant is right opposite the Colosseum!! What a spot for anyone looking to have a meal with a view! 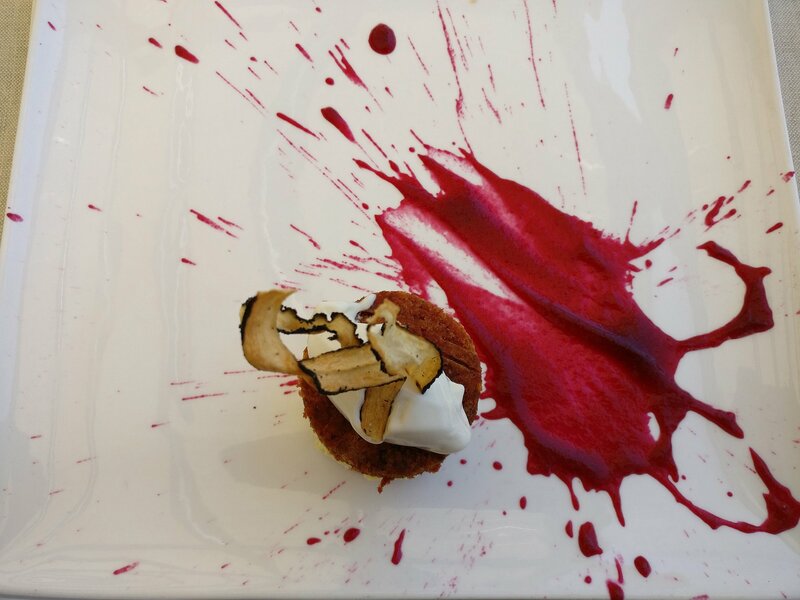 If you are looking for a place to have a meal in Rome, visit Aroma Restaurant, Rome! Chef Giuseppe di Ioro and his team do an exceptional work of running this place and that too at Michelin star standards. My amazing lunch started with wine from the region of Friuli Venezia Giulia + fresh parmesan bread. Oh and I also had the best seat right in the middle of the restaurant with the light on the Colosseum (hence shade on my side). The view of the Colosseum was so fantastic that I couldn’t take my eyes off it! My host, Alessandro, made sure he wasn’t overbearing to me but at the same time around for my needs. He suggested me the wine and also ordered ricciola in melone sauce with fresh herbs for my first course. I don’t call myself a food expert but definitely an enthusiast but what I can say was really good about was the fact that it blended in white wine and perfectly exquisite and light! 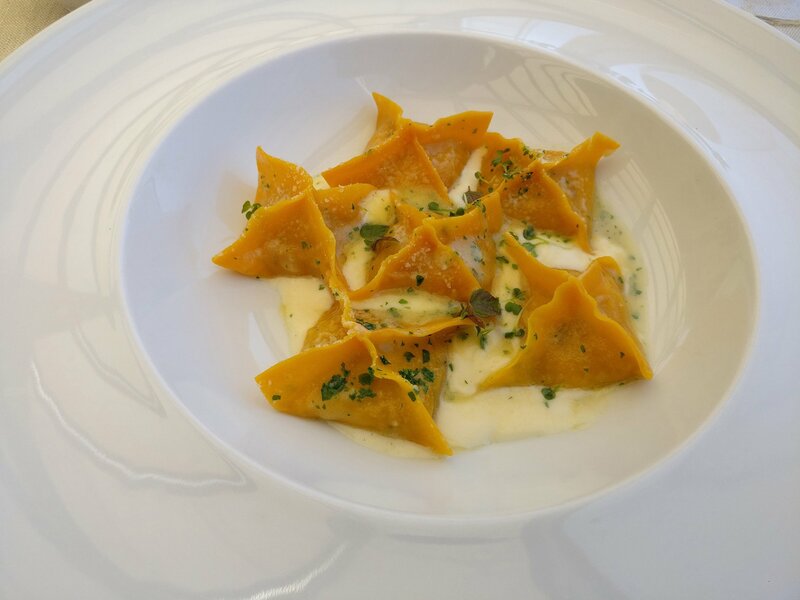 For the second course I ordered a buttery ravioli with olive oil and thyme in potato filling. This was simple seasonal food at it’s best! I enjoyed every bite with that view! The chef kept sending me greetings from time to time such as a light plate of starters or a dessert of chocolate and raspberry! ACCESS MORE ROME TRAVEL TIPS! 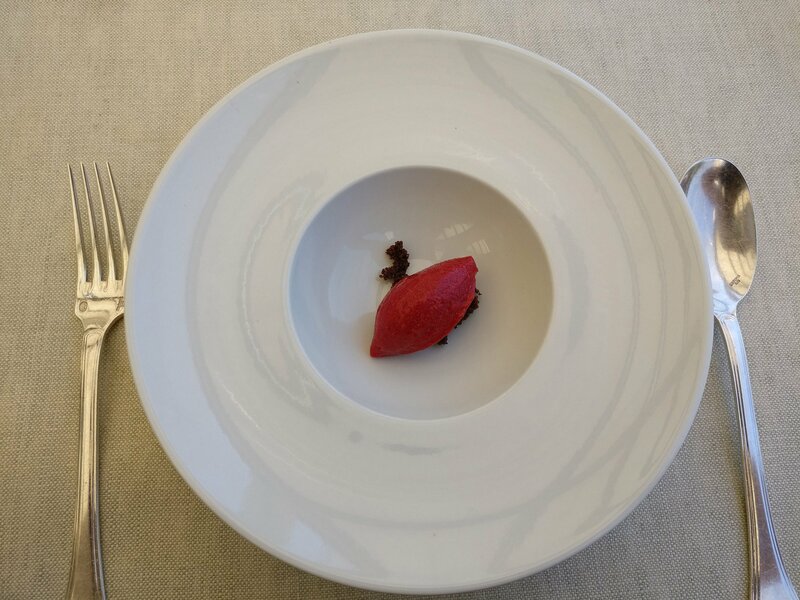 After spending 2 hours and being so content with my food, view and experience, I ordered a beetroot cake. 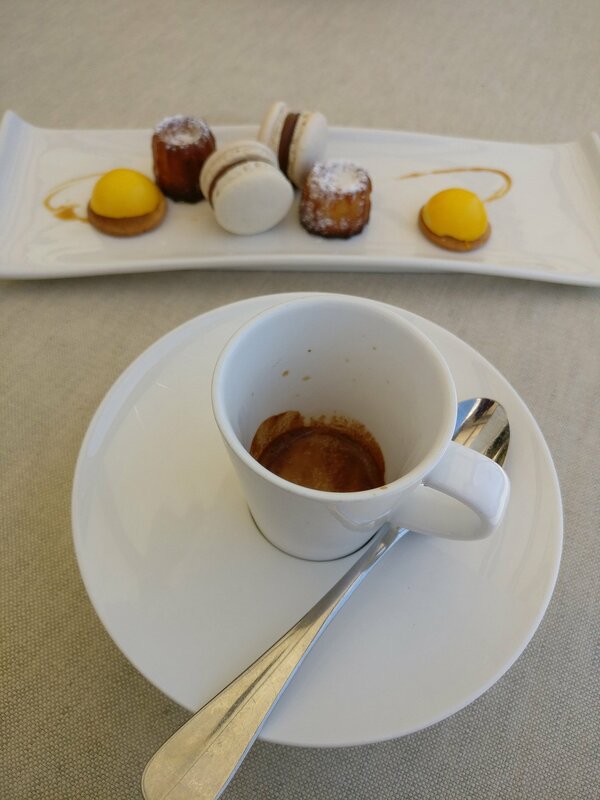 It looked right out of an episode of MasterChef, such a great end to a fabulous meal. I would highly recommend Aroma Restaurant to anyone looking for a meal with a view + a bit of quiet in all the rush of a big city like Rome. I spent around 3 hours there simply because the food was exceptional and fresh, the service relaxed and the views to die for! Aroma Restaurant isn’t as expensive as you are thinking. Check their menu for more! Thank you to everyone especially Marianna for making my day so special! Grazie mille tante!! ACCESS THE “3 DAYS IN ROME” ITINERARY! Disclaimer: I was a guest at Aroma Restaurant but all the views here are my own. Can’t wait to visit it again! I know how much you love Italy! Perfect place to soak in the view with different type of food. Cheers! Haha that was the aim 😉 thank you! Hope you are enjoying Rome! I haven’t been to Aroma but have stayed nearby – it’s a great part of the city and hope you get to explore it! I’m loving Rome. The city beats me every time I come. The other day at a known area I reached to an alley I never knew existed! Beautiful pictures. Great post. Looks fantastic. Surprisingly, I have written less about Rome on my website but you will see it coming more this time. The perfect spot to enjoy a wonderful meal. What a great memory for you!! Lucky you! Sounds like a perfect way to spend three hours in Rome. Thanks for the tip. I must try it when I go to Rome next time. I know what you mean specially a place like Rome. This time I had made a small list of things to do 🙂 it helped. Ishita, what a wonderful experience for lunch with front row views. How long are you here in Italy and will you be coming to Le Marche? Rome is one of my favourite cities. It holds a special place in my heart as we have family there as well, which always makes it extra special. I have just published my first post on Venice, so I hope to get to my stories about Rome soon. And will definitely have to look up this restaurant in Rome next time we are there. Fantastic view from Aroma restaurant! Welcome to Rome! Could not miss this view. We will be sure to eat here when we are in Roma in September. Posts like this help enable people to get the most out of their travels. My wife and I will be in Rome for a month, can not wait to keep discovering. Can you suggest a good pizza place in Napoli that isn’t on the main tourist road? But still easy to find, my partner and his son are visiting Napoli from Sorrento by train in a few weeks. It is their first visit to Italy. I wish I were going too. It look like a great place to visit the next time I will be in Rome. The view is really spectacular and from what you wrote, it look forward to trying their food as well. The food was yummm.. so not a tourist trap! 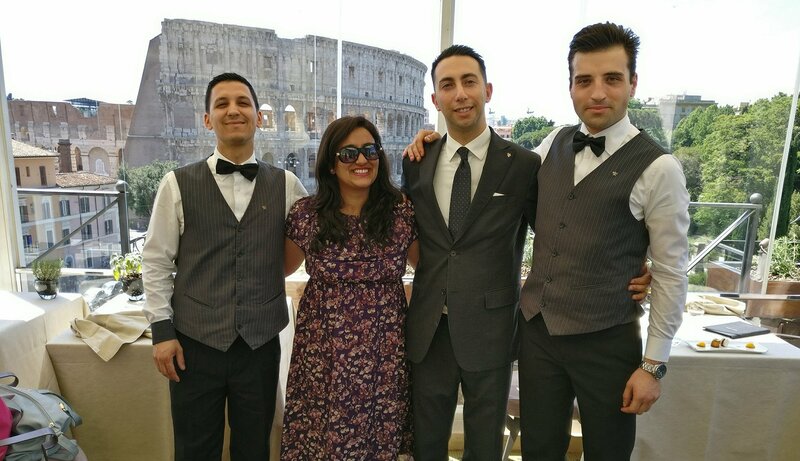 I am putting this on my list for the next time in Rome…and might I say you look rather glamorous surrounded by those handsome Italians. Thanks for your beautiful thoughtful appreciation. I love your post as it gives the real picture. Maybe highlight the important points from the post?? I always do that. Thank you so much i will try and do that throughout my writing. What a view…..ancient ruins and delicious food!! I would love to go to Rome , it seems so beautiful! It’s a beautiful city. You must! Thanks for the great tip. I’ve been looking for a good restaurant with a view. But you didn’t mention prices. Are you paying for the view, too? Wow this meal looked amazing! The view to top it off is amazing! Thanks for sharing. Thanks for reading. One of the best and not as expensive as I thought. Cheers!! We had our wedding reception here, it was absolute magic and the food was incredible!! It’s even more beautiful at night!